One of the goals of the Tango Center is to create a vibrant Tango dance music scene in Eugene. So, we need to find a way to inspire musicians. Before we opened the place, Mood Area 52 had already taken the initiative and created a Tango band with a very nice, unusual, but definitely tango sound. 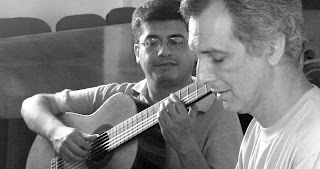 Then, in late 2003, Argentine Tango & jazz pianist Claudio Mendez came to visit us, with the phenomenal guitarist Daniel Gomez, in a tour organized by Bandoneonist Bertram Levy from Port Townsend, Washington. This visit inspired pianist Evan Griffiths, who's a superb dancer, to start a Tango band made up of members from the dance community. It's an amateur band, in the best sense, and now we have two regular Tango bands. On their current tour, we had Mendez/Gomez/Levy play dance Tango at the Milonga, and it was a gigantic hit. The next day they held a workshop, and probably, it wasn't attended well enough to spark another band. Most of the professional musicians I know say the primary factor in starting a music scene is money. If they feel it's possible to make a living playing Tango for dancers, they will. It's that simple. That's where the Golden Age of Tango in Buenos Aires came from ... hoards of dancers. On the other hand, they started dancing more when some superb bands emerged. We're lucky that we can get lots of dancers here, just by playing recordings of Tangos ... but that's not going to make a new movement. People really want to hear it live. Claudio tells me that unfortunately he can't make a living playing Tango for dancers in Buenos Aires. There are so many tango musicians, and duets & trios & sextets, that dancehalls pay very little, and then only if you contract to play milongas at one place every night of the week. By the way, I think we probably had a good format for visiting Tango musicians, who have a tendency to need to play something else too. At 7pm Saturday, we started a one-hour concert of whatever they wanted to play. At 8pm, we had our traditional pre-milonga lesson. Then they played Tango for dancing. I think this will work better when we have the beginning class and intermediate classes simultaneously ... the advanced dancers were kind of antsy during the concert, but they were really antsy during the introduction lesson. An intermediate lesson would have been just the ticket. We're going to try that starting mid-February ... Ev Marcel will teach an Intro lesson on the main floor, and Robert Hauk will teach an intermediate lesson on the Parquet. I saw this work at Cellspace in San Francisco ... the trick is to have traditional tango running at about half-volume continuously in the background. Works like a charm. Back to Claudio's comment on the scene in BAs ... it suggests that perhaps we should go down to BAs to hunt for Tango musicians to bring up here every week. A two-week tour, they can sell CD's, make more money than in BAs, and hold workshops with local Tango musicians. It's a traditional model in the world music scene ... Peter Gabriel hunted for talent this way to great effect, for example. If done right, it's good for everyone. After reading your blog "Inspiring musicians", I believe you will find the wages information on my site about Jobs With Best Wages to be very helpful. We have hundreds of "must read" articles on wages and careers and many other topics in our Top Career Wages site.